The installation will be completed within 24 hours by our Service Center once the access details to your hosting server has been received. Your website will be submitted daily to a number of high-trust websites - social bookmarks, web 2.0 and media Wiki resources, press releases, high authority profiles + you get social media signals telling others about your site (Pinterest repins, Tweet Retweets, Facebook shares). - FREE template and engine installation. - Fast, stable and industry-leading Web Hosting (includes unique domain name). - Language installation (up to 5 languages). Boost your website traffic and sales by ordering this incredible offer! Surely you will receive a report on work completed at the end of the project. WoFord theme is professional minimalist responsive prestashop theme built to create modern powerful e-commerce web site. 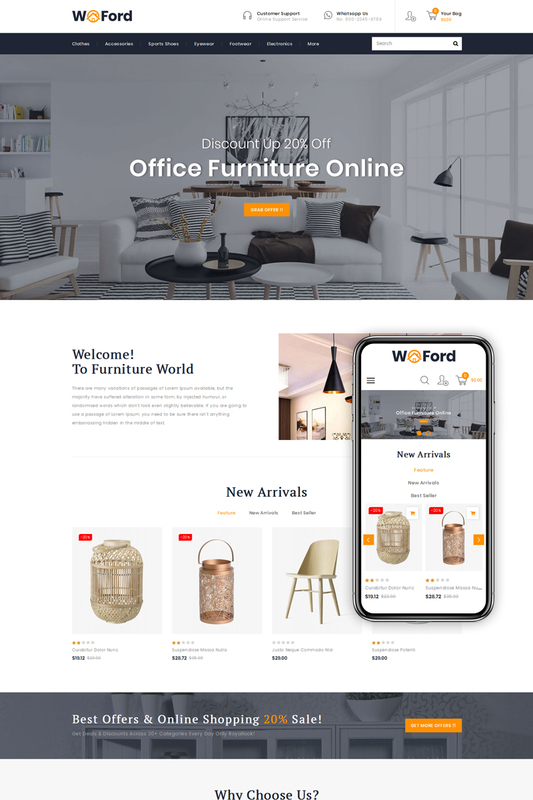 WoFord theme enables you to reach the widest customers base, with a multipurpose and responsive layout that performs seamlessly across mobiles size, tablets and other devices screen size. WoFord theme has a bundle of functioning features of a modern template for multipurpose store web site and supported latest version of Prestashop 1.7.5.x with added 1-click (Quick Start) package to get a replication of our theme demo site on your website with same demo content, graphics, theme settings & layouts.